This photo was taken from the second floor balcony of the St Charles Hotel, or as it was known at the time, the Pony Express Hotel. 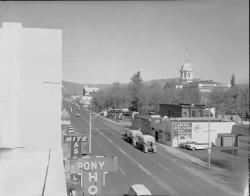 The photo is looking north on Carson Street from Third. The Mite As Well bar is occupying the corner location of the Pony Express Hotel. Beyond Third Street are signs for Morris Motors garage and Mercury Cleaners. Across the street is located the Capitol Roof and Floor, advertising their siding, insulation, and linoleum. Next door are a couple of cafes. The stone building on the southwest corner of Carson and Second streets was previously home to the Nevada Appeal newspaper and dates back to the 1860s. Parallel parking is permitted on Carson Street. Earlier, in the 1930s and 40s, angle-in parking was allowed along here. There is also a sidewalk running the length of Carson Street, in front of the Capitol Building. In the far distance you can barely see the Senator Cafe at the corner of Carson and Musser, as well as the old post office breaking the horizon.